The highlight for many was the pelagic trip out of Scarborough Harbour although we didn’t have any surprises it is always nice to be on the sea getting some nice close views of sea birds in their element. 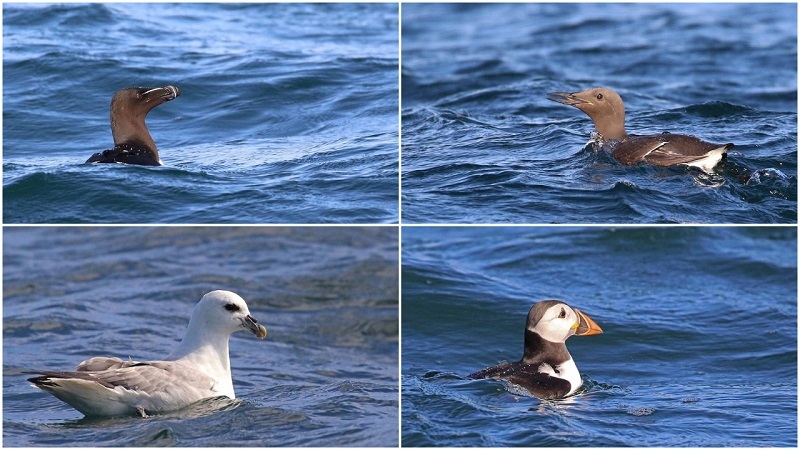 The species seen included Herring, Great and Lesser Black-backed and Black-headed Gulls, Kittiwake, Common Tern, Razorbill, Guillemot, Puffin, Fulmar, Cormorant, Kestrel, Peregrine and a Red Admiral butterfly!!! On the mainland there was an early morning sighting of an Osprey with a trout at approximately 06.30 at Sutherbuff Rigg, Dalby Forest then it or another went south at Long Nab at 15.15 and was seen finally today flying around Wykeham Lakes at 20.06. A ♂ Honey Buzzard was seen briefly at 13.35 at Wykeham Raptor View Point along with 6 Common Buzzards and 2 Goshawks during the early afternoon, the fourth consecutive day with records of this species. Also today 9 Mandarins at Harwood Dale Lake and 295 Swifts flew south at Long Nab. It has been brought to our attention that people have been walking around Wykeham South Lake gaining access from the viewpoint. Birdwatchers are being blamed for these intrusions on private property with the threat that the screen will be removed. If anyone sees anything in relation to this matter then please let us know by contacting me on bluechaffinch@btopenworld.com or by contacting Nick Addey.